After more than six hours of baseball the previous day, Texas had to come out ready to play once more in order to sweep a 3-game Big 12 series over Kansas State. 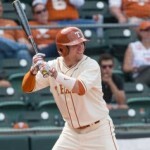 For the first time since 1993, UT had its starting pitcher bat in the designated hitter spot in the lineup. Faced with these responsibilities, sophomore Kacy Clemens did enough to earn the sweep-clinching win over the Wildcats, 6-1. After Friday’s series opener against Kansas State was postponed due to weather, the Texas skies were calm enough for Texas to notch two conference victories over Kansas State. 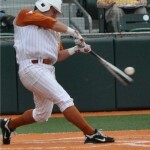 In the first game, Texas came back with a big eighth inning to win 5-3, while Chad Hollingsworth and Kirby Bellow dominated the Wildcat bats in the second game, 3-1. 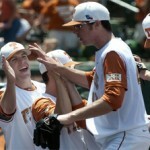 In the first game of conference play, Texas got a walk-off victory with the help of freshman walk on Connor Macalla. Macalla’s sacrifice fly in the bottom of the 10th to bring home senior Brooks Marlow capped off a night of outstanding pitching from seniors Parker French and Kirby Bellow in Texas’ 4-3 victory over the West Virginia Mountaineers. 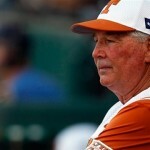 Following a dominating series sweep over Minnesota, Texas returned to the field on Wednesday after their game against UTPA was postponed from Tuesday. Texas came out as cold as the previous night’s freezing weather in the first half of the game, but rallied back to defeat UTPA 5-4 thanks to a walk-off single by freshman third baseman Bret Boswell. The bats were not the only cog in the baseball machine that performed well, as the pitching staff surrendered no runs on just six hits, and threw three consecutive shutouts for the first time in 13 years. The defense also made every play it needed to in the Longhorns’ 8-0 win over the Minnesota Golden Gophers. Run support is a pitcher’s best friend. 17 hits makes it easy for pitchers to attack hitters early, and that’s exactly what Parker French did in Friday’s series opening 13-2 win against Minnesota. Hits came early and often from senior right fielder Collin Shaw and freshman catcher Michael Cantu, who had five RBIs on a 3-for-5 night. With what seemed to be a game that held a pitching change every inning, gaining momentum was difficult for each team. Thanks to an error on a routine single by Ben Johnson that slipped under the centerfielder’s glove, Texas was able to open the floodgates, and eventually won 14-2 in the first game of the 2015 season at UFCU Disch-Falk Field. 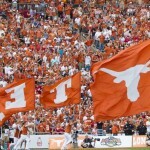 When I stepped on campus in 2012, I knew Texas had come off of two of its most disappointing football seasons. We had just come off of a win against Cal in one of our many Holiday Bowls. Mack Brown was going to right the ship with evil genius Bryan Harsin and long-time favorite Major Applewhite. Manny Diaz’s defense was going to be one of the best in the country. We even beat Ole Miss. Texas Football was going to mean something while I was a student, just like it should be. The State of the Union for Texas baseball in 2014.